In the last few months, we have seen changes at UGL with many valued members leaving us for retirement. 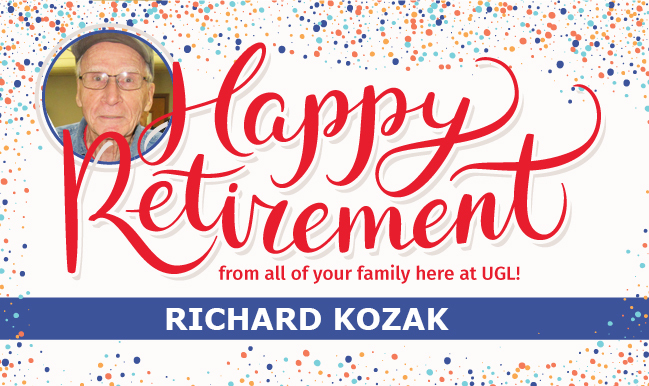 The latest to bid us farewell is Richard Kozak who has been with UGL for 50 years. Richard worked in the advertising department at UGL assembling trade shows for shipping and point of purchase displays for in-store advertising, always with a smile, a joke, and a unique song. Yes, Richard started at UGL in 1969. News stores include The Beatles’ last public performance, on the roof of Apple Records; Pontiac Firebird Trans Am, the epitome of the American muscle car was introduced, and Woodstock attracted more than 350,000 rock-n-roll fans. All those events were memorable but for us none more so than Richard entering our doors and ingratiating our lives with joy and laughter. We were able to get a lot of work done while creating lifelong memories and friendships. Thank you to Richard, it has been a good ride. Enjoy time with your family, it all goes too fast.